Nothing better than the fall colors on the Ocklawaha River. When the Florida Gators are playing football on the last Saturday in November, chances are real good that the river is very quiet. The Ocklawaha originates in the Green Swamp, and is fed by Silver Spring on the way to the St Johns River. We will do the 10-mile section from Ray Wayside Park to Gores Landing. We will meet at Ray Wayside Park at noon on Saturday, November 26. We will shuttle vehicles to Gores Landing, then begin our paddle. We paddle 2-3 hours and find a suitable primitive campsite. There are no developed facilities. We will enjoy a gorgeous fall sunset and have a delicious meal. Planting Outing (Service) Saturday, December 17, 2016, 9:00-Noon. 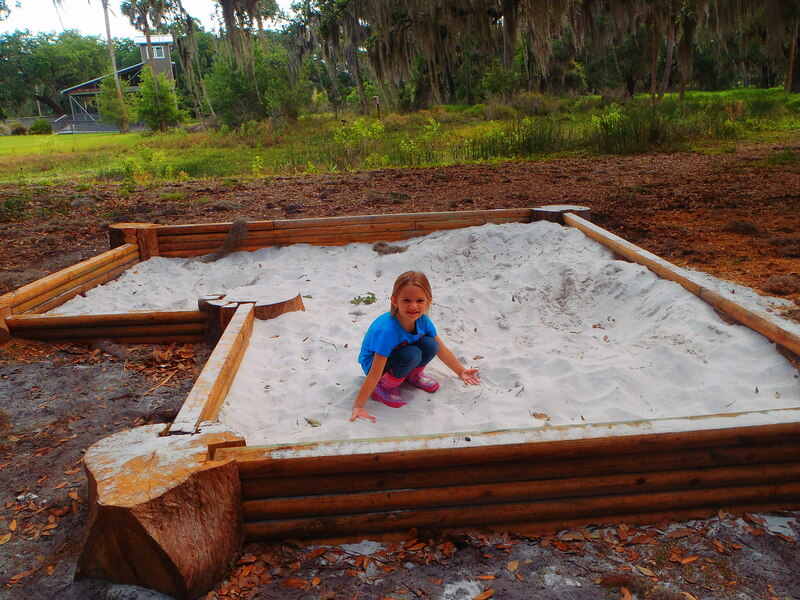 Contribute to our jewel of Nature Education, the Nature Discovery Center, at Circle B Bar Reserve, between Lakeland and Winter Haven. This outing we are beautifying these grounds by planting native trees such as beauty berry and green ash. Folks learn about native plants and enjoy the company of nature conservationists. To find us, as you drive in the parking lots at the Nature Center, take a left. We will park behind these buildings. Andy will be wearing a purple “LSU” and will have a shovel in tow. Please contact Andy Quinn, 863-683-9600 or email abquinn2010@gmail.com for more information. Backpack Florida National Scenic Trail, St Marks National Wildlife Refuge. Monday, December 26- Friday, December 30, 2016. There are many surprises along the Florida National National Scenic Trail in the panhandle. You will be invigorated by cool crisp weather, great friendships, breathtaking forest and proximity to the Gulf of Mexico. We may be even able to see lots of wildlife or a lighthouse or two.Along the way we will be shuttled over the St. Marks River. Costs are $150 and include eleven meals (one of which will be a restaurant meal in St Marks, if they are open! 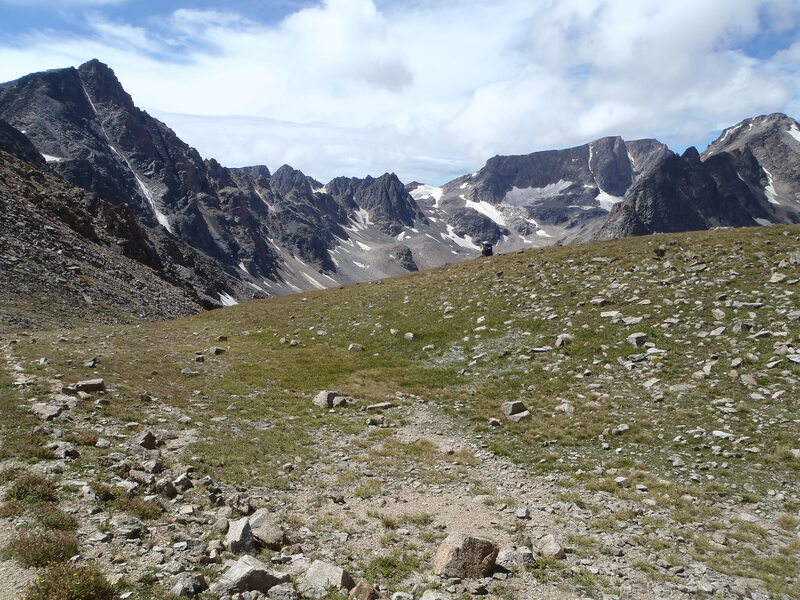 ), camping fees, shuttle fees, Sierra Club donation and use of group equipment. We will meet at Noon Monday, December 26 at JR’s Aucilla River Store on US Hwy 98 just east of the Aucilla River. I love the Rockies. The Northern Rockies. These spectacular wild places where a beast can easily swipe you head off with a paw. These places where conditions leave you shivering, gasping, aching wondering why you donned a 40lb pack to climb strenuous slopes. These wild places that make you feel the best you have ever felt, your senses acute and tingling, that all is good and that we can do anything in front of us. My most important request as a leader is that participants consistently think well of each other. Human beings consistently look at Nature as a place of healing. If one has negativity about the situation or another, the protocol is to take it out of the kitchen or fire ring, let it go, and come back as the loving person that they naturally are. The participants of this trip followed this direction scrupulously. 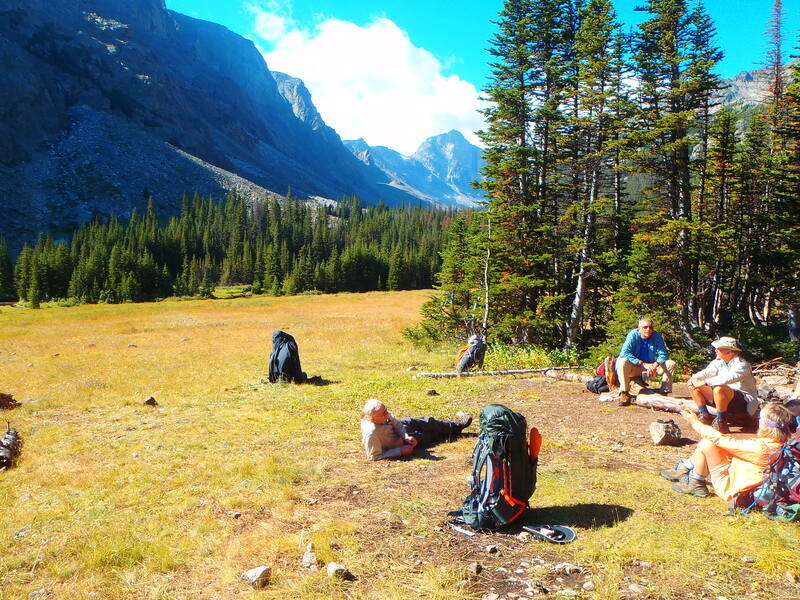 Interestingly, two to the participants stated in the pre trip meeting that their goal was to continue their healing journey and to reclaim their natural sense of peace in these Rocky Mountains. Rewarding as a leader that they accomplished what they seeked. After some invigorating cross country that included boulder hopping, we were stunned by Black Canyon Lake. My goal was Grizzlies. Yes Grizzly Bears. For me Colorado, California and the other beautiful Rocky Mountain and Cascade Mountain states seem rather dead, without the Grizz. Kind of sounds silly, stupid, even reckless, but for me it is only the rational. I am a 21st century man and I I love the humbleness that comes from surrender, the ache of fear that nature can bring to us, the primordial dreadful idea that we may being watched or even hunted. Now truly the risk in the lower forty 48 is not great, but for me Colorado, California and the other beautiful Rocky Mountain and Cascade Mountain states seem rather dead, without the Grizz. People love the big mammals. I know this as I observe nature conversations go to the big cat, bear, elk or moose. 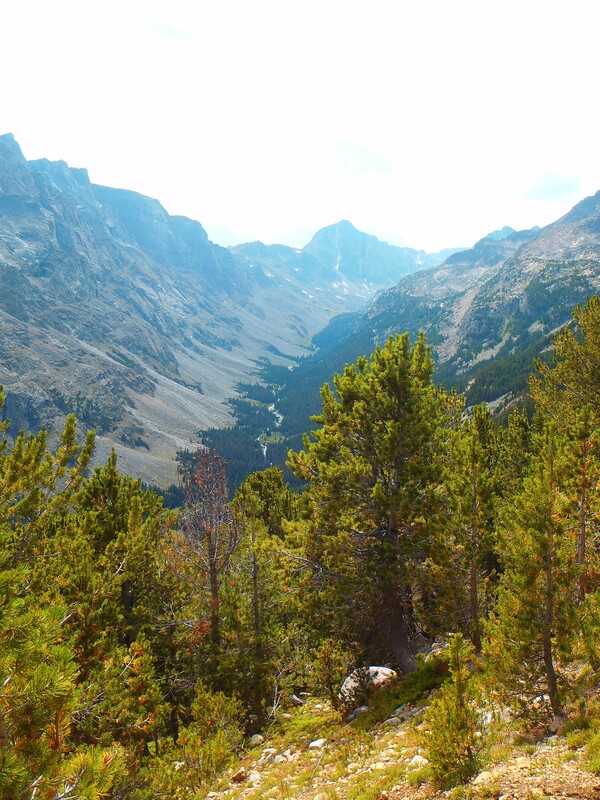 For me the Abasorka-Beartooth Wilderness just north of Yellowstone represented a place where the Grizz and Wolf could run freely, without being hassled by naive tourist. One of the first documented Grizzly fatalities was an naive tourist who decided to prod a Griz cub in a tree in Yellowstone. Mama Grizz was prompted to devour a hole in his chest. Things were different in the 19th century where the old world ideas of bears and wolves were connected to the demonic world. The big mammals were looked upon as a threat to the idea of Manifest Destiny, the idea of going grab the land if you have more powerful weapons. In fact the demise of the big mammals and native people is also marked by the era of the repeating rifle. Sounds eerily similar to the way the government and the owing class of the “Land of the Free” in modern times. Except now we do it in Kenya and Iraq. The corollary to Manifest Destiny is basically the idea that white Europeans could do whatever they wanted to Nature. Millions of Buffalo and Wolves were slaughtered, along with the existing 100,000 Grizzlies. The buffalo and wolves became almost non existent, Grizzlies were reduced to hundreds only in the Northern Rockies. The decimation of the plains Buffalo, along with the white people diseases was the end of the Grizz and Native People. We know that all Native folks weren’t saints, but we do know that most tribes were connected to the land and there was serenity and happiness among these folks. In fact the big bear, the Grizz was revered by some tribes as the author of the universe, the English translation goes as something like “the Medicine Grizzly.” And now in our short sighted society, there is so much dissatisfaction and restless in a society that values entertainment and cell phones. Just go look at the numbers…..our ERs are filled with humans that the doctor can not diagnosis and his prescription is therapy. The numbers of people being treated for anxiety is 17%. The bears provided a calender for me when I got back from Vietnam when one year would fade into the next and I would lose great hunks of time to with with no events of people or time to recall their passing. I had trouble with a world whose idea of vitality was any thing other than the naked authenticity of living or dying. The world paled, as did all my life as it had before, and I found myself estranged from my own time. Wild places and Grizzly Bears solved this problem. Interesting that I feel a sense of connection to Doug as former Vet and environmental activist, without meeting him. Both of us see nature as a healing modality…..in which one just has to show up and be respectful. I am indebted to Doug for inspiration and for his efforts to protect the Rocky Mountain Front from the Narcissists that run the oil companies. So I was enthralled when Deb the Ranger in the Custer National Forest gleefully announced that here were 40 Grizz’ in the Abasorka. 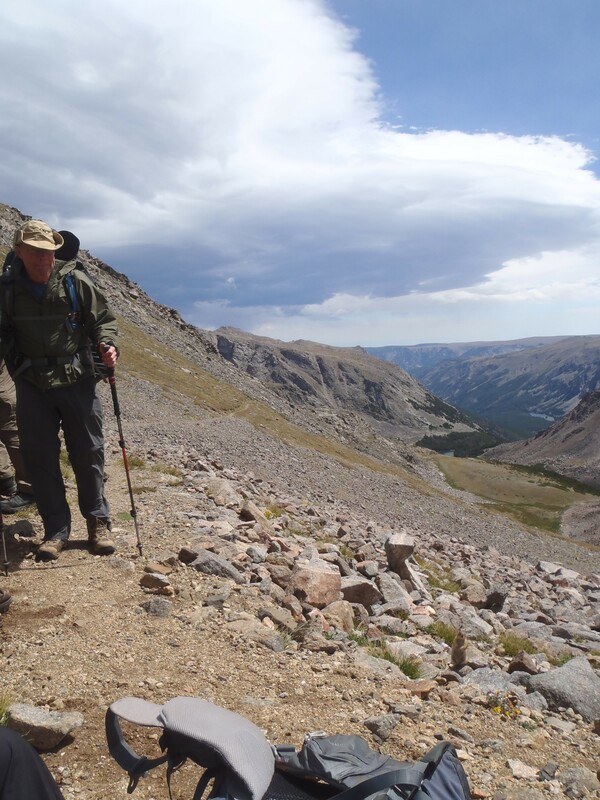 Although we never saw a Grizz, it is truly a reward hiking and sleeping in a place that has some semblance of wildness. I must admit that I struggled in this trip. I found myself rather adverse to the whole situation, day by day. I finally woke to the fact that it is tough to lead, be in charge of the food, and deal with challenging mountain conditions. We did get a significant amount of rain, and had a huge storm with snow, thunder and lightning and high winds on the 5th night. Some folks got wet in their tent and one person’s tent pole was broken. The next morning people included me seemed drained. The rewards of the trip was that folks enjoyed the food, had plenty, and they really enjoyed one another. 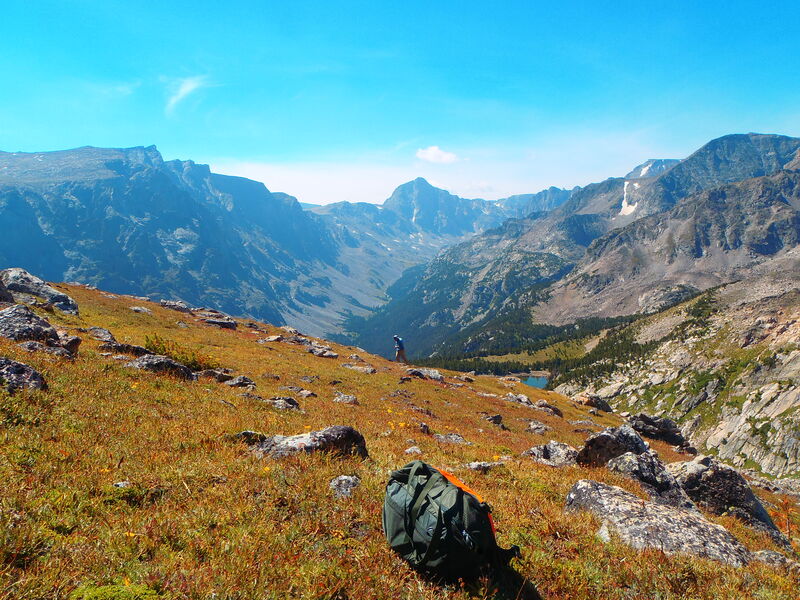 I look at backpacking as a physical challenge, and enjoy feeling like I am a little tougher and stronger when I get home. I knew it going in, that this area is spectacular, and when I saw it,these mountains rivals any other area that I have been to. 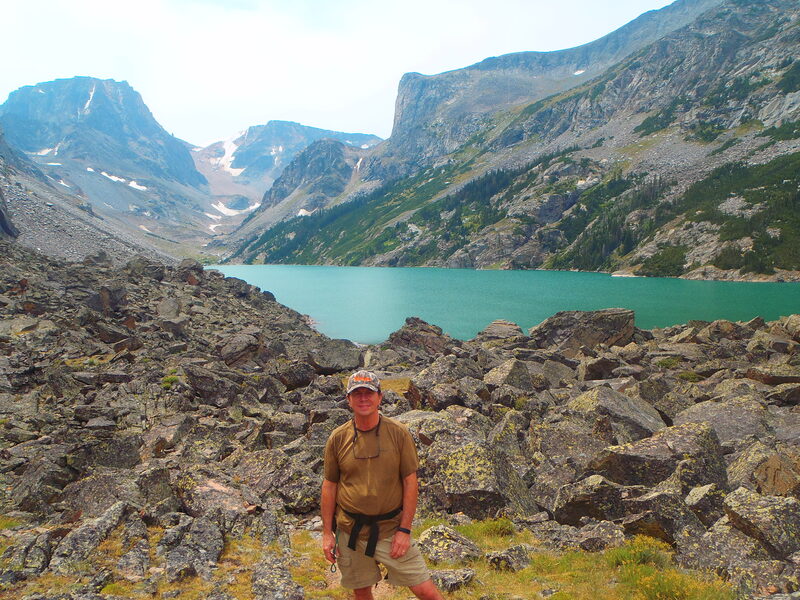 I am grateful to the Sierra Club, Roger Grissette and Rudy Scheffer for this wonderful opportunity to experience a place that is warm to my heart, the northern Rockies! Thanks for being a wonderful co leader Rudy! It was great to have you manage the kitchen! Next post will be about food. Please join us for the camaraderie and fun of native planting at the Polk County Nature Discovery Center at Circle B Bar Ranch, 8am, Saturday October 3. 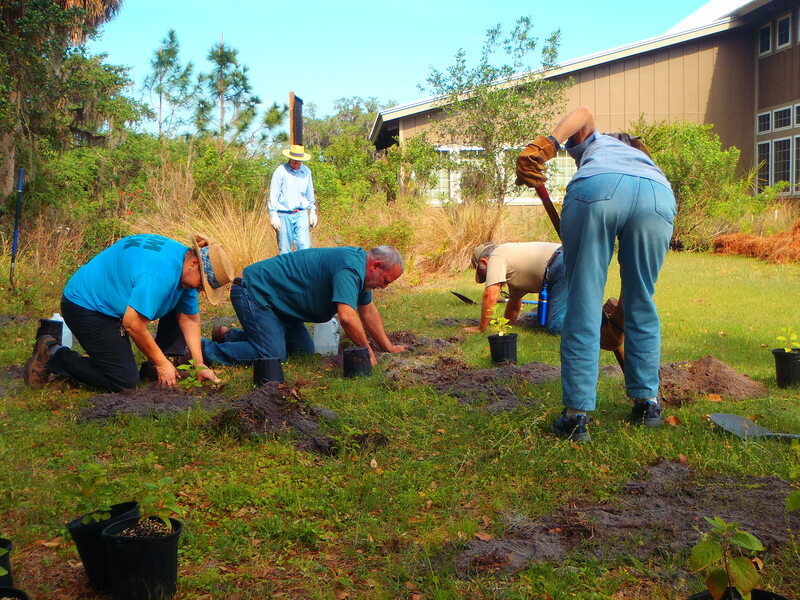 We consistently have a great time planting native plants of Florida. Please bring tools, but most importantly bring an attitude of connection with the best conservationists in the land, Sierra Club. We usually end up feeling a sense of excitement and gratitude by contributing to this jewel of environmental lands and nature education at Circle B Bar Ranch. Families are welcome and typically have a great time doing this service outing! The conversation among Nature loving folks is often stimulating discussions around how to help our planet heal, wildlife and absurd tales of crossing mountain passes in a blizzard!! We will meet in the parking lot, just west of the Nature Discovery Center. We have a water thermos, but bring your water bottle to minimize the use of plastic bottles. Bring sunscreen, hat and a shovel. We typically will work 2-3 hours. Although Ancient Islands Sierra Group will provide water, we encourage you to bring your own water bottle to minimize the use of plastic. Please bring copious amount of sunscreen and your own shovel and gloves. Please contact Andy 863-683-9600 or abquinn2010@gmail.com for more information. There aren’t many places where you can see wild horses grazing along the beach. There aren’t many places where crumbling ruins of a 19th century Carnegie mansion sit frozen in time, within hiking distance of your wilderness campsite. There aren’t many places where you can sit in the tiny chapel of a settlement once inhabited by the descendants of slaves. 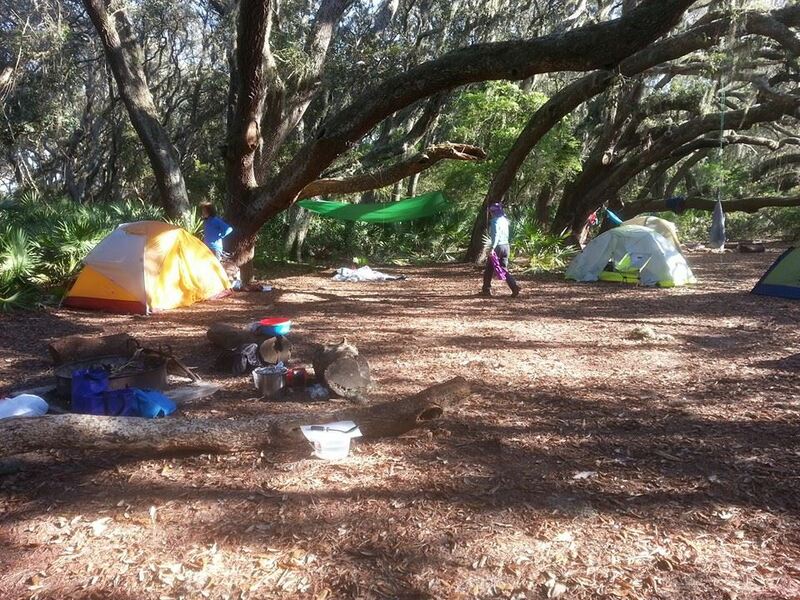 Cumberland Island is the place where you can experience all of this and more. 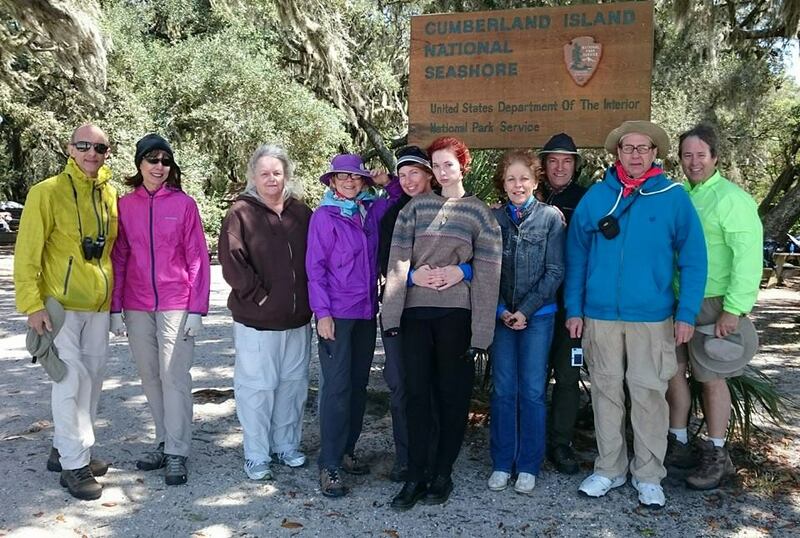 Ancient Islands Outings participants enjoyed three days of pure joy at our recent Cumberland Island National Seashore Backpack trip. The ferry ride alone is worth the trip! Cumberland Island, Georgia, is located near the Florida state line, just across the Cumberland Sound from Amelia Island. A scenic wildlife habitat, the island measures about 17.5 miles long by 3 miles wide, and is Georgia’s largest, southernmost barrier island. It encompasses maritime forests, wild beach, freshwater lakes, saltwater marshes, and over 9,800 acres of wilderness. It is a place of solitude and quiet. 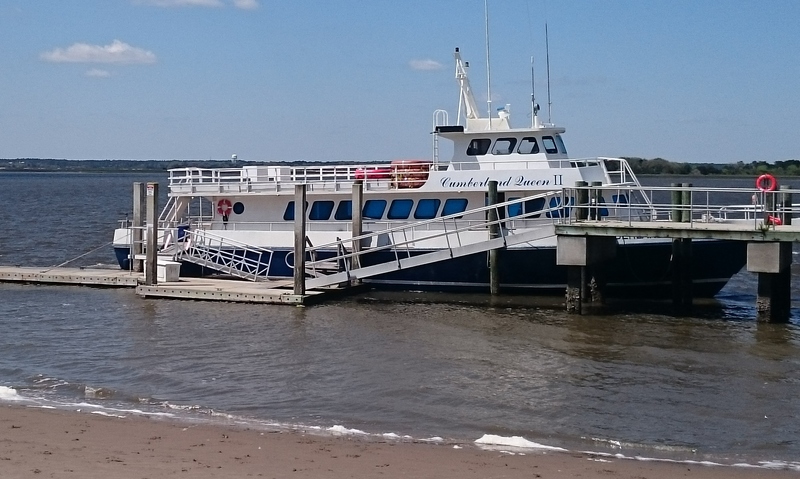 Our group of 10, led by Gail Bagley and assistant leader Dan Clark, disembarked from the “Cumberland Queen” ferry on a chilly and windy Saturday morning and checked in at the Ranger Station for orientation and campsite assignment. Then we hit the nearby picnic table to prepare our first meal – Curried Chicken Salad – which was quickly devoured. A 3 ½ mile hike took us to our tranquil Stafford Beach campsite, where we were to stay for 3 nights. Stafford is a backcountry site that has a fire pit and is about 500 yards from a bathroom with non-potable water. It is sheltered and shaded by a canopy of huge oaks, making it hard to imagine you are just a short hike from the beach. We quickly divided up our chores, which included meal preparation/cleanup, setting up the tarp shelter, creating a hoist to animal-proof our food supplies, water purification, and starting a fire. We set up our tents, pulled out the “kitchen” gear, and started preparing our Mediterranean Stew dinner. Throughout the evening we heard a Great Horned Owl calling its mate. 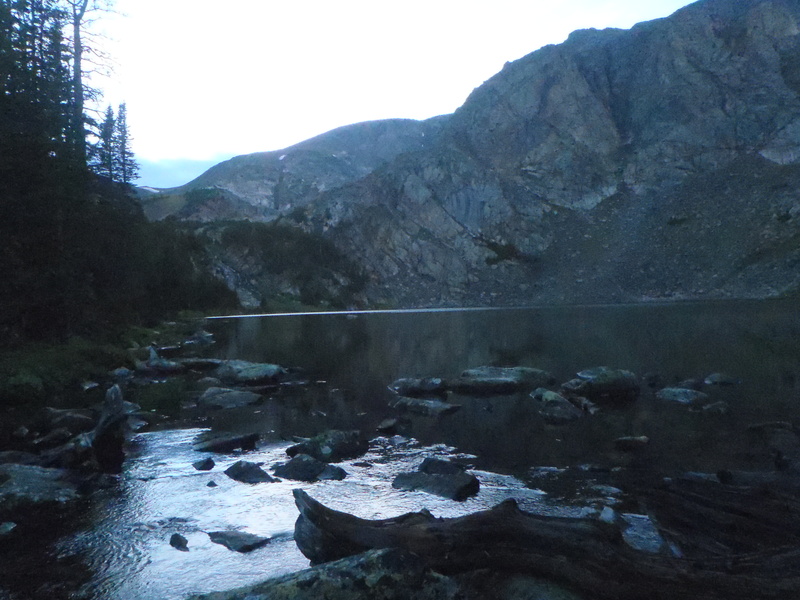 We were up at about 6am Sunday morning, enjoyed a hearty breakfast of Steel Cut Oatmeal with fruit and nuts, then hiked 3 ½ miles back to the Ranger Station to meet our van driver for the Land and Legacy tour. This tour is a relatively new (since 2011) way to enjoy Cumberland. We included it in our outing because it would have been impossible to hike the long distances to the sites seen- especially those at the northern end of the island. Our park volunteer/driver, Bernie, added much in-depth knowledge and understanding to our Cumberland experience. He had previously been the resident caretaker of the island’s famous Plum Orchard Carnegie mansion, and had developed close relationships with the few residents who currently inhabit the island. At the north end of the island we stopped at “The Settlement”, which dates back to the late 1880s, and is a small village of former slaves. This is the location of the historic First African Baptist church – a tiny timber chapel that became famous as the location where John F. Kennedy Jr. wed Carolyn Bessette in September 1996. Judging from the time we spent sitting quietly in the chapel and then taking photos outside, you might think we had visited Cumberland for this one experience! Monday morning was a lazy one, and we were slow getting things moving. Breakfast was a (rehydrated) hash brown/eggs/turkey sausage casserole. Before breakfast, one of our participants had to leave the outing due to illness. Dan was extraordinarily helpful and generous in escorting her safely back to the Ranger Station to catch the next ferry, while the rest of us hiked to the south end to explore the Dungeness Ruins. Dungeness was originally a home built by Revolutionary Was hero Gen. Nathaniel Greene’s widow, Catherine. In 1884 Thomas and Lucy Carnegie began building their mansion upon the Greene’s foundations. We stopped along the way for a picnic lunch of tuna salad, and were thankful that a little lunchtime rain did not turn into an all-day downpour. Tuesday morning was another 6 am rising time! This was our last day and we did not want to miss breakfast, nor did we want to miss the ferry back to the mainland. Instead of having breakfast at our campsite, we packed everything up, said “goodbye” to Stafford, and hiked back to the Ranger Station. There we enjoyed the luxury of picnic tables and potable water, and Dan prepared his famous and delicious blueberry pancakes. It is interesting to see how differently backpacks are loaded on the return trip compared to the arrival. On the return trip you have partially washed cookware tossed in with your camp trash, on top of your dirty laundry. You just need to get it out of there. One of my favorite aspects of any outing – especially those with new participants – is watching the teamwork that develops and builds each day. Skills and interests grow as someone becomes the campfire person, another becomes the meal person, someone else becomes the water purification person, and so on. By the end of the outing, you have a well-oiled machine, as they say! I believe one thing our participants would all agree upon is that Cumberland Island is a special, healing, one-of-a-kind place of solitude. We are thankful that the property is protected by the National Park Service. Cumberland was at one time on its way to becoming built up with hotels, houses, marinas and golf courses by real estate developer Charles Fraser of Hilton Head. He abandoned his plans after Island residents joined with environmental organizations and the Department of the Interior to support the acquisition of Cumberland by the National Park Service. We are thankful that Cumberland will remain in its wild, natural state, a destination for future Sierra outings. 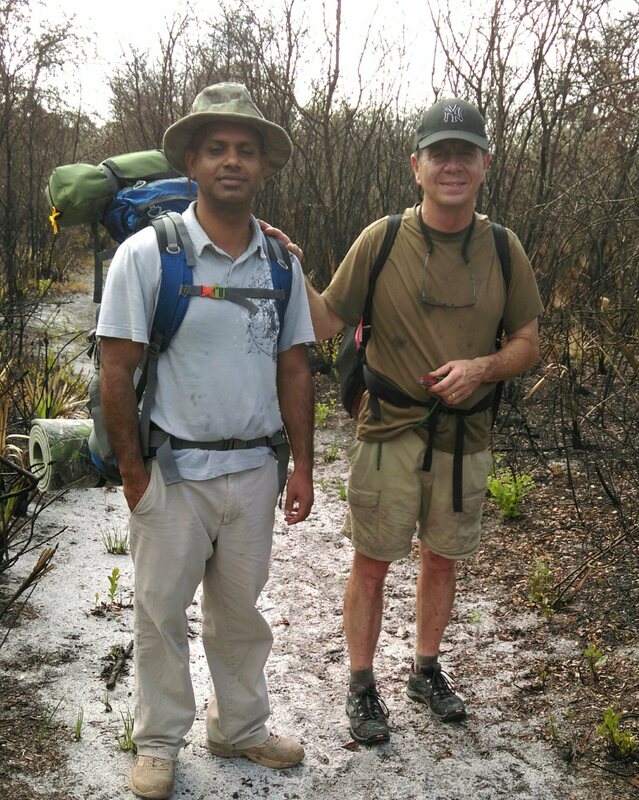 Have you wanted to backpack but didn’t because of inexperience? Wouldn’t it be helpful to have an easy one-night “beginner” trip where experienced backpackers help you learn basic backpacking skills? 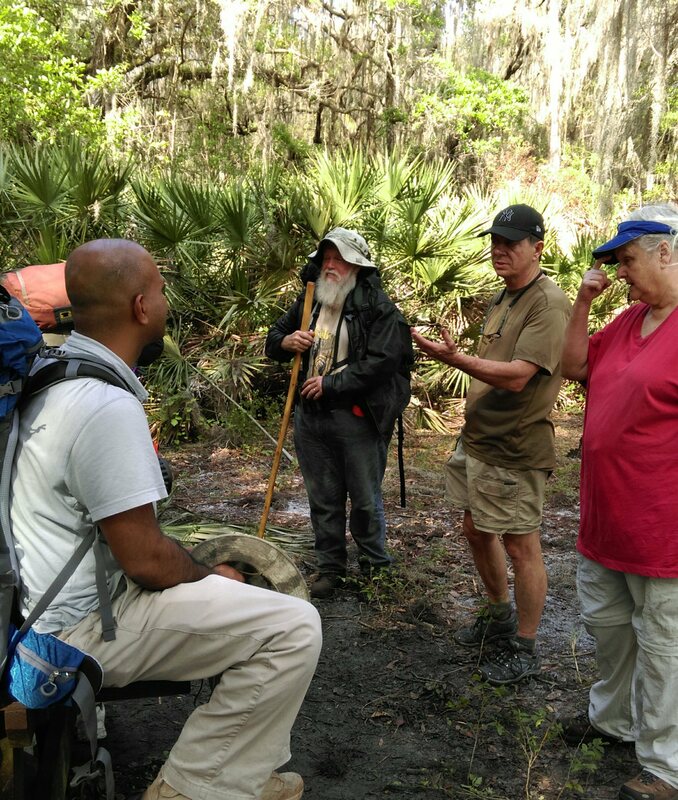 That is exactly what the Ancient Islands Outings offered the participants on our Feb. 28th Lake Wales Ridge State Forest Beginner Backpack outing. 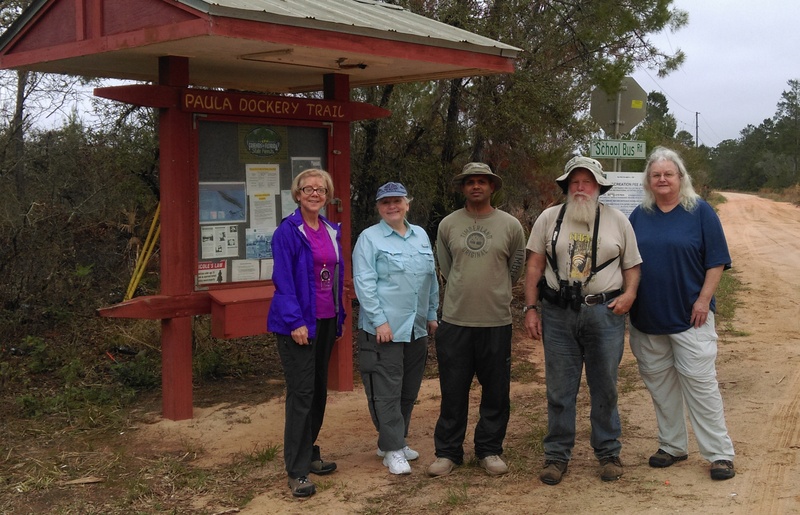 Four adventurous participants- Tom, MariKaye, Melanie, and Rakib- plus leaders Gail and Andy- assembled at the Paula Dockery trailhead Saturday afternoon, then proceeded to hike about 3 1/2 miles- some along Livingston Creek- to our Lakeside primitive campsite. LWRSF consists of four tracts. Portions of the land were purchased with Florida’s Conservation and Recreation Lands (CARL) program funds. As the name suggests, the land is managed for recreation, protection of endangered and threatened species, and maintenance of natural communities. Our outing was in the Arbuckle Tract, which is located 5 miles south of Frostproof, on Lake Arbuckle Road. The hike took us through scrub oak and pine forest and Tom helped identify a number of warblers and other song birds along the way. We had known in advance that it might “sprinkle a little” this weekend, and we had prepared by bringing rain gear. That was a good move! The closer we got to the site, the bigger and darker the clouds to the East grew. When we reached the end of our trail we were stopped by a stream between us and the campsite. Thankfully there was a fallen palm which had been previously placed across the stream and which enabled us to nimbly cross to our campsite. A light rain started just as we arrived. 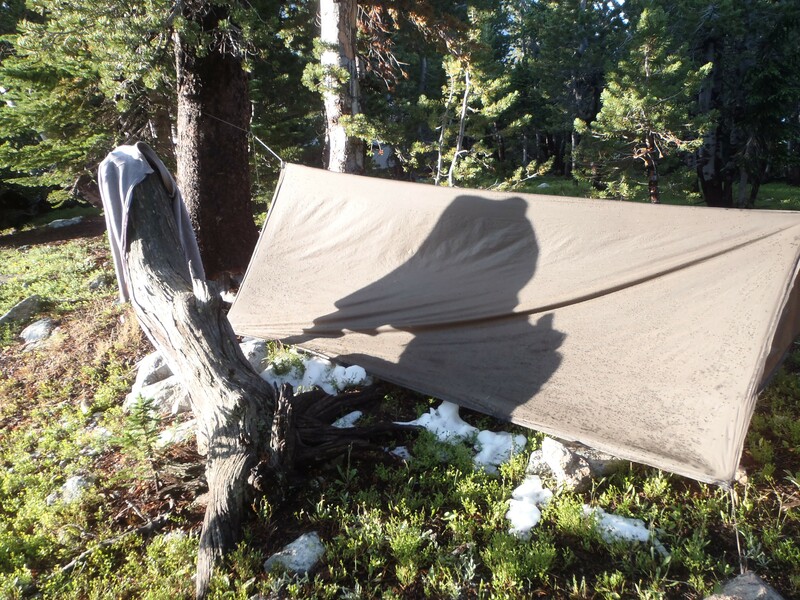 Assistant Leader, Andy, taught the first lesson: put up the tarp shelter! When that was done we scurried to set up our tents. In the drizzle, we devoured a yummy dinner of southwestern chili. Leader Gail had previously cooked and dehydrated the chili at home, and it was easy to prepare at the campsite by simply treating and heating water from the creek, then rehydrating the chili. Dehydrating food in advance makes it conveniently lightweight for backpacking and prevents spoilage. It was remarkably tasty! With amazing teamwork, participants gathered firewood and soon we were enjoying a roaring campfire. This was a welcome treat, allowing us dry our hair and clothes. We shared stories, sang a Native American song led by Melanie, and poked at the fire. Before we retreated to our tents- warm, dry and cozy- we spotted the moon peeking out from the clouds. The rain was passing! When we arose Sunday morning, the sky was gloriously clear and the temperature was perfect. We enjoyed a hearty breakfast of steel cut oatmeal with cinnamon, nutmeg, fruit and nuts. Hot coffee was prepared with treated creek water. After breakfast, Andy took a few minutes to teach a lesson on foot care. It is critical to take care of your feet while backpacking; you can be quite miserable if you don’t. Wet skin increases friction, and friction causes blisters. Dry, moisture-wicking socks and comfortable “broken-in” shoes are essential. Since we had plenty of time, we did not have to rush to leave camp. We cleaned up, extinguished the fire, put on our backpacks and headed out. The trail was a bit soggier from the rain, but not enough to cause any problems. New flowering plants had popped up on the trail that were not there the day before. When we arrived back at the trailhead, we did what good Sierrans do – we picked up trash and left the trailhead area cleaner than we found it. A leisurely lunch was enjoyed as we sat by the creek; then we said our goodbyes and headed home. Participants were all good sports about the weather. They talked about their new backpacking and camping skills, and were excited about putting them to use on future trips. It is our hope to have more “beginner backpack” outings, so please think about it if you want to give backpacking a try!